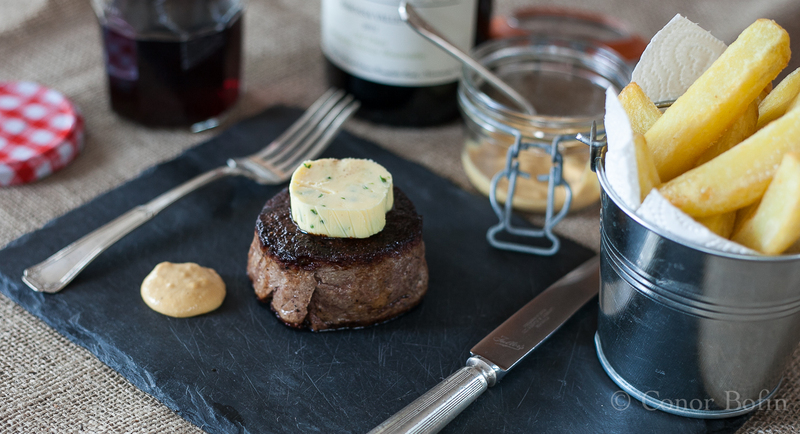 Porcini Crusted Fillet Steak with Garlic and Chive Butter – Fine dining on the building site. In a café beside our office in Sandyford, they serve the scones on little wooden boards. I think they are called shingles in the building trade. Weatherproof, very trendy and they only need a wipe with a cloth between servings. When we have our coffee there, we have fun watching patrons scrabbling around on the floor to retrieve the mini jam jars that slide off the shingles like rain off a roof. The madness of using building materials in food presentation doesn’t stop there. No, we have grown used to the ‘trend’ for serving chips in buckets. With every shovel of the cement of fashion into the mixer of dining, we seem to move further and further into the building site. 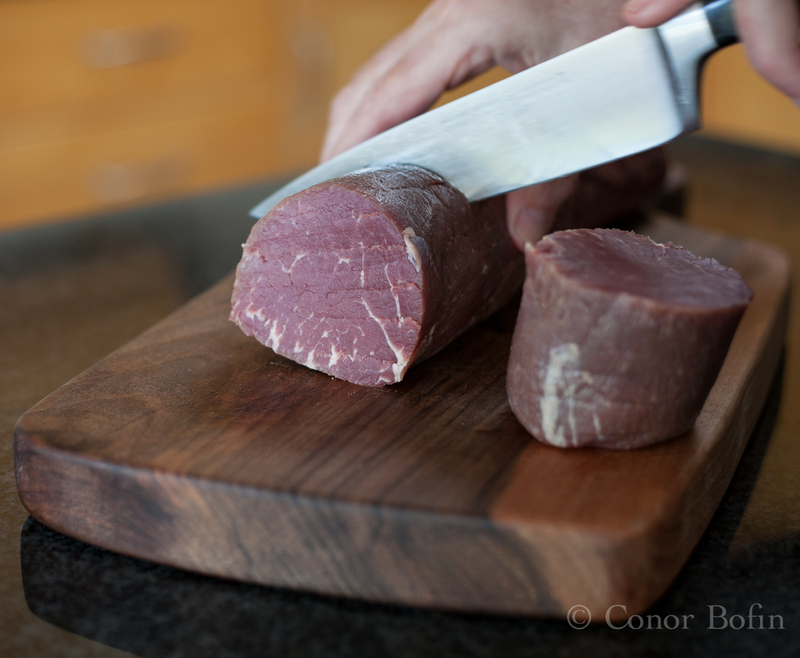 But, when it comes to serving a prime Irish beef fillet, don’t serve it to me on a slate. For crying out loud! Wake up! Fries in a bucket and steak on a slate. I have even had my milk served in a jam jar, in true building site style. Have you all gone mad. Or is it me? If I want to eat a steak, I want to eat it off a plate. If I happen to hanker after some nice crispy chips, I want them served beside the steak, on the same plate. If I want some nice Australian wine to go with it, I want it in a glass. Now, where was I? Oh yes, a nice Irish Fillet Steak with Garlic and Chive Butter with Crispy Chips. 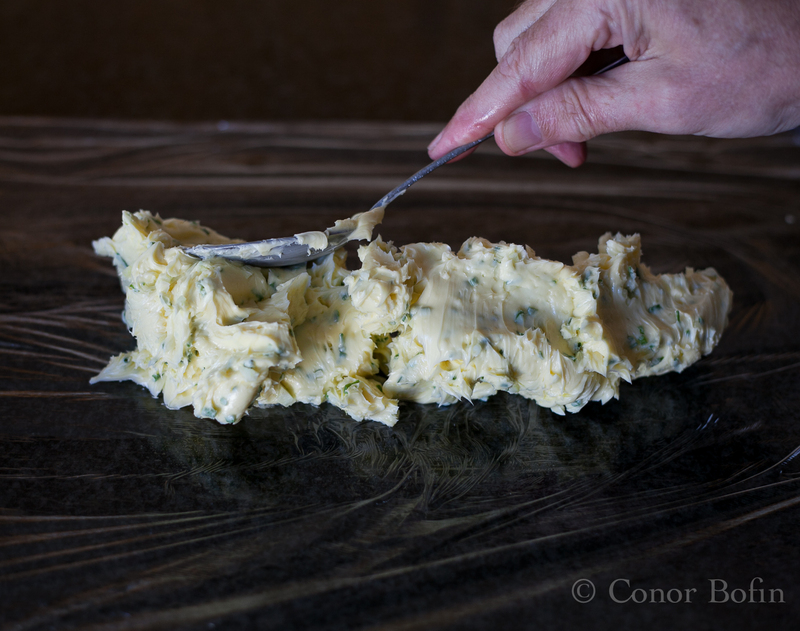 Let’s start with the garlic and chive butter. There are only three ingredients. You can guess what they are. 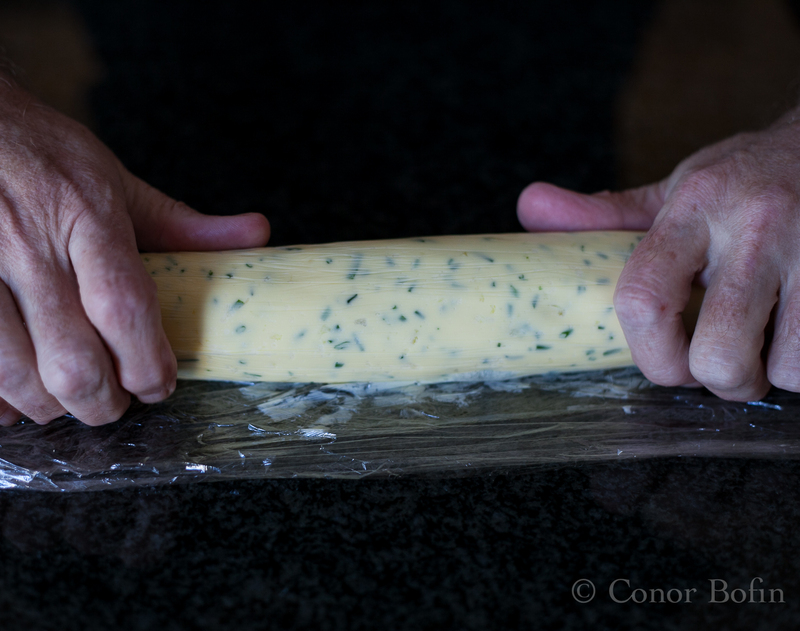 Garlic, chives and butter. 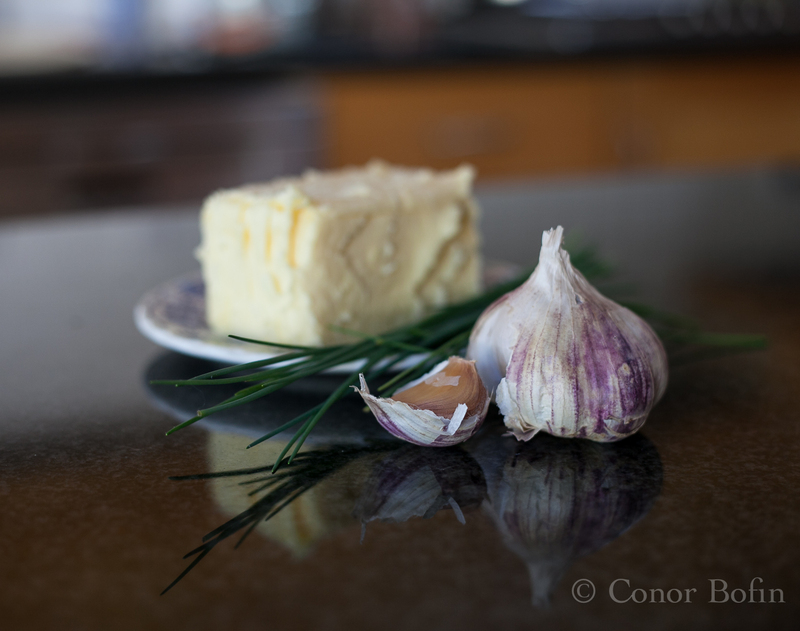 The ingredients needed for the garlic and chive butter. Tip about 300 grammes of butter into a bowl. 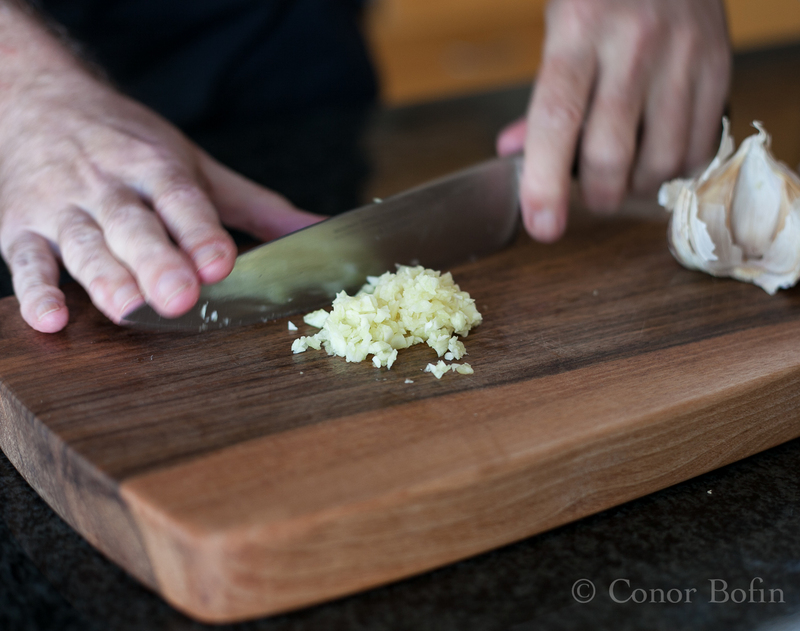 Chop two cloves of the best French garlic into very fine pieces. Use a knife and a chopping board. No building implements needed. 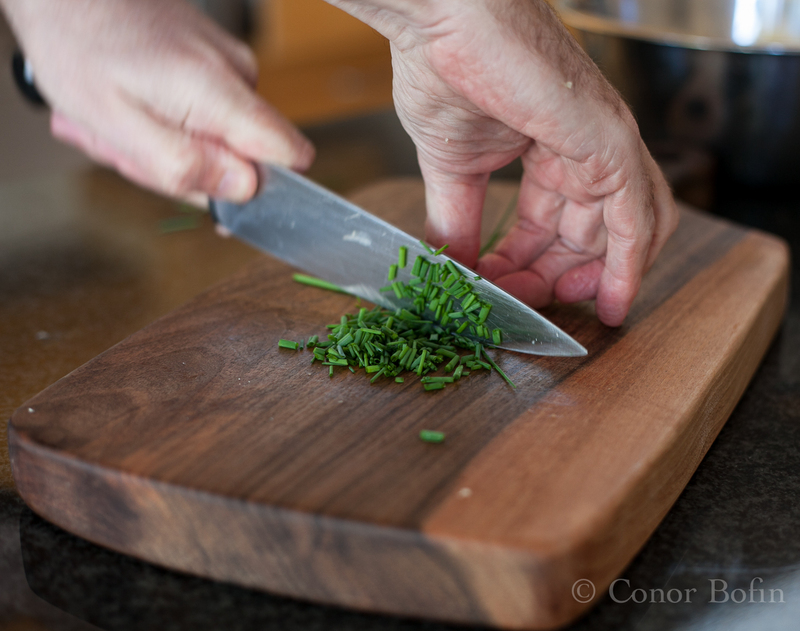 Next chop the chives up nice and small too. Give the chives the same treatment as the garlic. Note the daft hand position to allow the photo. Add the chives and garlic to the butter bowl. Use a spoon to beat the ingredients together. You will know when they are blended as the chives will be evenly distributed. 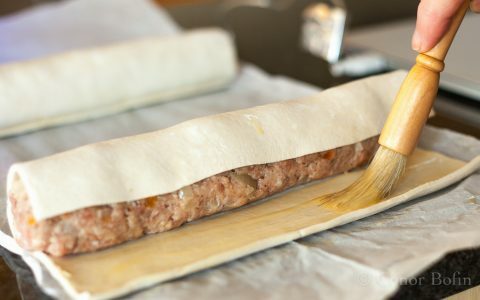 Spread the mixture in a tube shape on some cling film. As good a tube shape as I can make with butter. Roll it into a tight tube about 3cm (1 inch) wide. Note the even distribution of chives. Expertly rolled. Chuck this into the fridge and turn to more important maters. (It can be stored in the freezer for months.) The most important part of this preparation is the porcini crust. To make this, spread dried porcini mushrooms on a tray of foil. Heat it in a 100ºC (200ºF) oven, for ten minutes, to ensure the mushrooms are REALLY dry. This lot made enough powder for a dozen steaks. We did not have a dozen so half got stored. 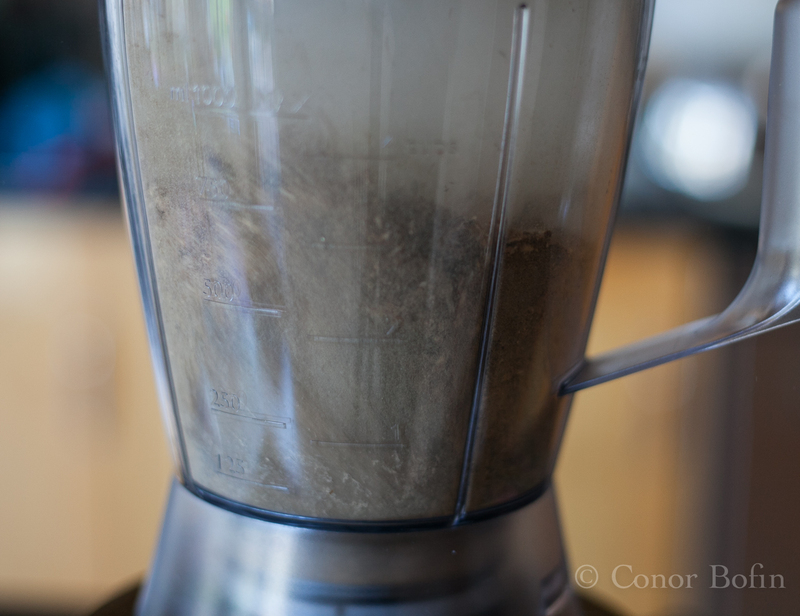 Tip the dried porcini into a food processor and hit the loud switch. Pretend it’s a cement mixer, it makes you feel any more like a restaurateur (or builder). The aromas that leak out of this while they are being blended are amazing. The porcini will turn to a fine dust, somewhat like cement. Perhaps that’s where the building materials theme comes from? Put this to one side and prepare the potatoes. 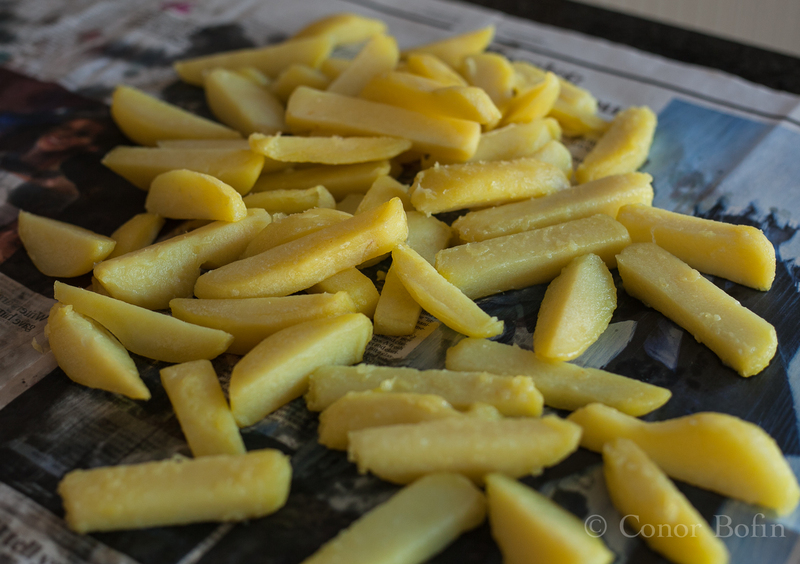 Peel and slice them into chips (If you are American, I mean fries, not crisps as we call your chips.). Soak the chips (fries) in a big bowl of water. Put the bowl of potato to one side and leave it for a couple of hours. This will extract some of the excess starch. Heat your oven to 200ºC (390ºF). This is to finish the steaks. Drain the potatoes and pat them dry with a towel. Heat some cooking oil to about 130ºC (250ºF). 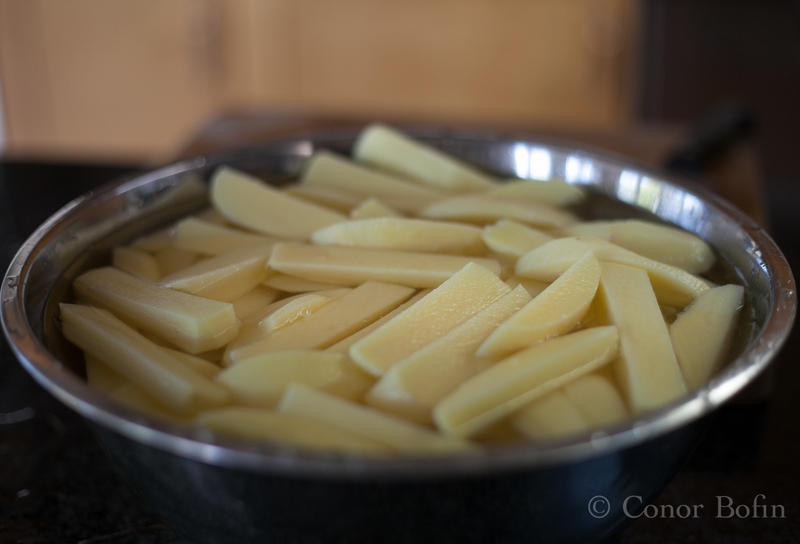 Fry the chips, in batches, for about 5 minutes. Drain on old newspaper. This is the first of two cookings they will receive. The half cooked chips draining on an old newspaper. Next, prepare the steaks for needless photography. This is a totally gratuitous meat slicing shot. For my more dedicated fans. 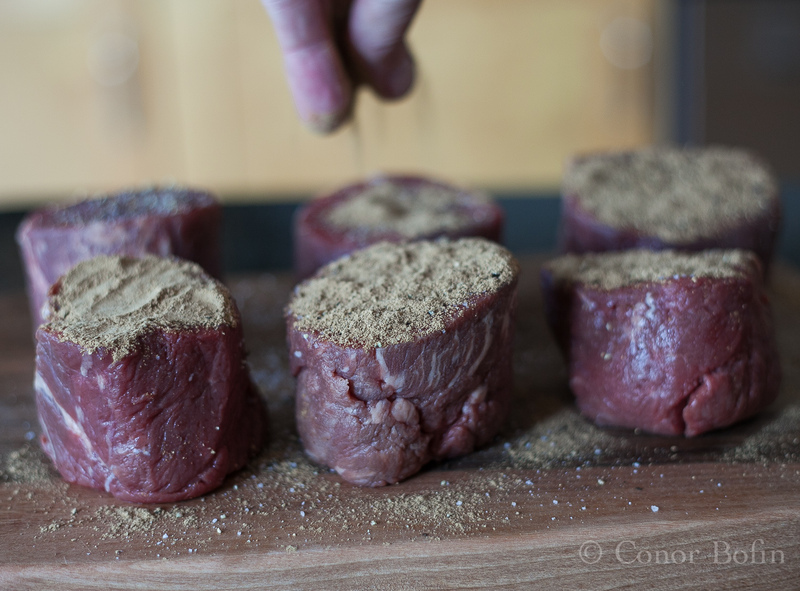 Season the steaks and then give them a good covering, top and bottom with the porcini dust. Add plenty of the dust. This is crust spelt with a ‘d’. We like dust crust. 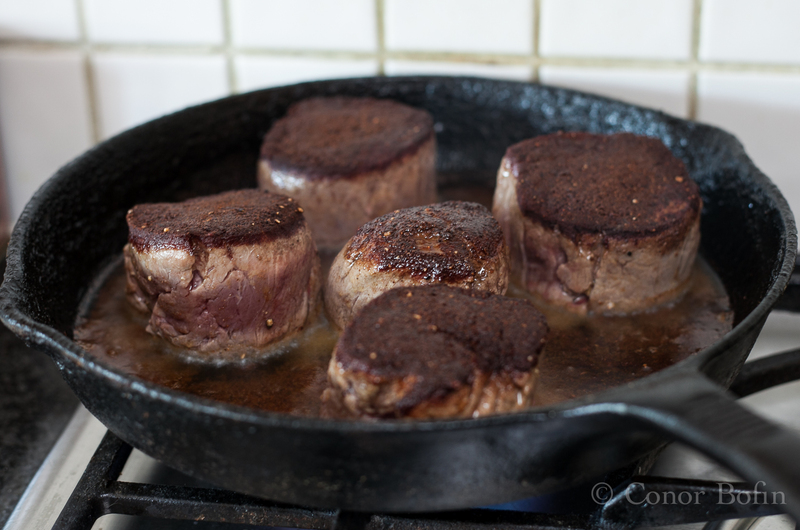 Add some oil to a hot pan and add the steaks. My cast-iron pan holds five. The dust has turned to crust. 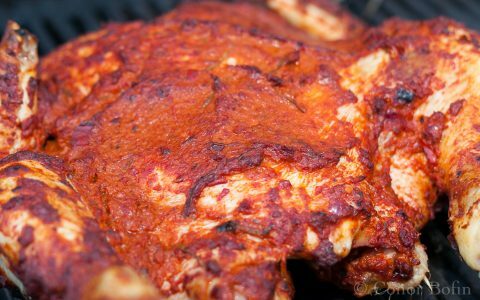 This has incredible flavour cooked in. Cook the steaks for a couple of minutes a side. Then put the pan into a 200ºC oven for 6 minutes. This should give you medium rare steaks. 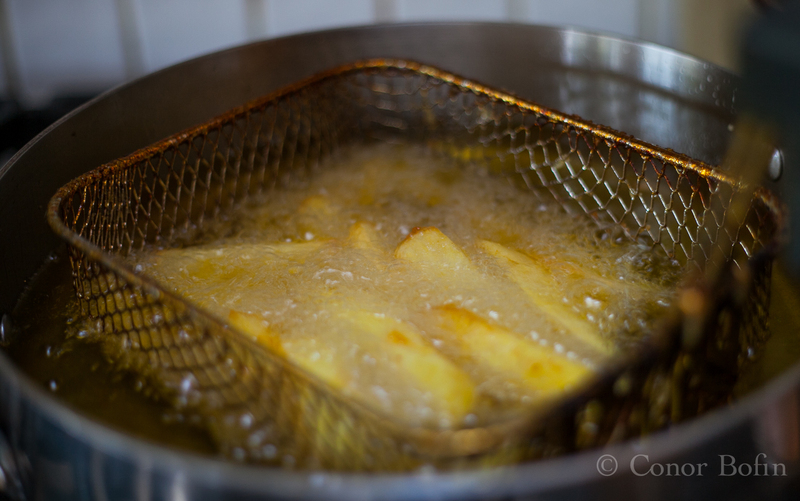 While the steaks are cooking, fry off the chips in batches at 180ºC (360ºC). The chips get very crispy on the outside. Light and fluffy on the inside. Now comes the truly pathetic bit of this blog post. The assembly of the dish and serving it in ‘fashionable’ style. To do things the trendy way, I set the table with an old cement sack. I served the ‘Torbreck GSM’, a lovely Australian wine, in a jam jar. The home-made English mustard is served from a Kilner storage jar. The chips are served in a bucket. 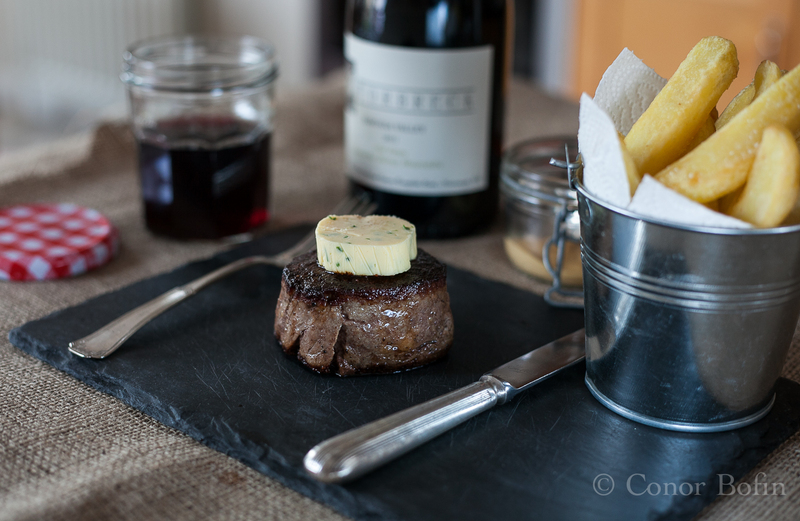 To top it all, the fine steak is presented on a piece of old slate. This is total madness. Why am I getting involved in this nonsense? Despite the ridiculous presentation, this was a really tasty steak and chips. In truth, I transferred the food to a plate before I ate the lot. Though, I could not resist drinking the wine from the jam jar. We have to maintain some fashion standards after all. Next time you are dining out and your food arrives in a bucket or on a slate, think of me….. laughing at you! References and thanks: My friend Peter Borza supplied me with the bucket from his Camino Cafe, recently opened in Cornmarket, Dublin 8. Writer, Tom Doorley has previously exposed the nonsense of this sort of thing in his fine article on the subject. The nice people in Weafer and Cooper in Glasthule were kind enough to supply the slate, despite my less than complementary intent. Mark and his team in The Coffee Shot (best coffee in Sandyford) haven’t barred me either. Thanks to all for being such good sports. Hot smoked dry brined mackerel - You CAN have too much of a good thing. I have a dark secret. I did recently run a competition with a couple of my blogging friends where I encouraged both prep and serving on the board. The link is: http://wp.me/p1NUXa-1qp. Not quite building site stuff but, it does weaken my ‘plates only’ argument. Conor! I am deeply saddened to hear this! Although sharing platters do work very well on platters like this. I suspect that would taste good no matter what the container. This post cracked me up, food goes so cold on those slate plates! This looks the business and is that The Steading GSM? Very nice, very nice. That’s the regular ‘Old Vines GSM’. Pretty decent itself. No hardship in drinking that, no sir! As Jessica Jayne said, lumps of wood are as fashionable as slate. These odd presentations can seem interesting if one quirky restaurant uses them, but when they all throw the plates out with the bath water it becomes quite daft. There’s a reason why plates have a lip – it’s to stop the juices spilling onto the table. Somebody bought me a piece of slate cheese board about 6 months ago – it came in a box. Somehow I suspect the box cost more than the slate! Thanks MD. I did manage to spill some beef juices onto my sackcloth table cover. The slates really are a silly idea. As is my using it. Kate, you are my virtual conscience. I hoped nobody would call me out on that. Still, I had fun with this one. That is an awesome idea with the porcinis. Have you ever tried grating them over risottos or pasta? It gives a great depth of mushroom flavour without the sliminess you sometimes get when you rehydrate them. Oh also, in a strange twist of events, I can now make it down to the Blog Awards so I’ll see you there! The grating is a very good thought. What I usually do is reconstitute them and chuck them in the pan with other mushrooms as I cook them down. I use the soaking water in the risotto too, once I have put it through a cloth to remove any grit. 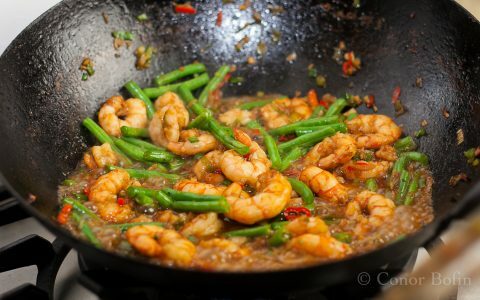 The water take on a huge amount of the flavour and really strengthens up the risotto. I look forward to seeing you on the 4th. Wow this is a beautiful meal. I love all of those flavors. And compound butter, yum. I actually found a beautiful piece of slate while hiking and brought it home as a cheese board. Amanda, listen to what I am saying. Use a copper nail to fix that slate to your roof. Get a cheese board or preferably a plate! I kind of agree with you. I told my husband not to take it, but he insists that he wants salmon served on it. I cannot imagine how this will turn out…well, now i can. Tell him to eat on the roof. Thankfully I can laugh at myself Conor!! But seriously, I don’t use slates or buckets (unless it’s supersized and full of spuds) in my food shoots but I’ll admit a jar with a cute straw has appeared on occasion – and boards, lots of boards, but not for eating off..
Jars are fine as long as you use a straw. I have to admit my transgression on most fronts too. Still, I enjoy a good rant, even if I am as guilty as the accused. Hmmm, I have dried porcini mushrooms. 🙂 I’m with you on serving on plates though the presentation you show is beautiful. But not to practical! I admit it makes for a nice photo but the eating off the roof tiles is a step too far. You’ll love my distressed serving platter. You see I purchased a new serving platter. But I didn’t think much of it, so I distressed it. I now cannot decide what to serve on the platter, but that isnt important. And I cannot imagine anything better than drinking wine out of a jam jar. Maybe scotch. My mother was over that evening. She really enjoyed the steak. I think she was a bit aghast at me drinking a fine red from a Bon Maman jar. I look forward to seeing your platter. We need to start a society so that we can rant about eating off things that were never intended to be eaten from. It’s my pet hate and I rant about eating off breadboards and sipping drinks from jam jars all the time. Power to the people! Bring back plates! Let’s form that society. “The Food Standards Agency” or has somebody else got that one? Sadly yes. Let’s call it People For Plates 🙂 let’s get campaigning. No more eating off bits of wood or the tiles from bathrooms. The worms are turning! This post was hilarious and bought back so many memories from when I first moved to the States from London. My dad took us to a country style seafood restaurant and they served the drinks in jam jars. I was mortified and wondered about all the choices of moving there. Years and blogging no less, I’ve become accustomed to jam jars, ribbons on cookies, chips in buckets and so and so forth. Gorgeous steak and esp love the slicing shot! The whole menu looks wonderful! Thanks for visiting and for your very kind comment. I missed a trick there with the ribbons. I should have wrapped the steaks in nice blue and pink bows. On second thoughts, perhaps not. Do Ken. Easy and very punchy flavour. Brilliant post Conor! 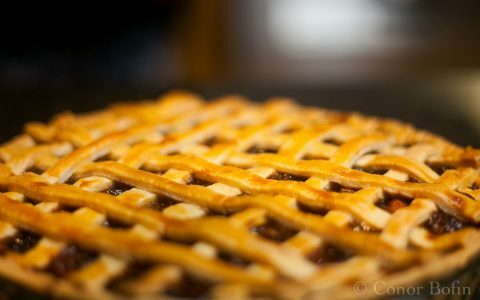 I love your dry humor mixed in with some really good food photography and an awesome recipe. Love this idea of a porcini mushroom dust crust. My hubby’s b-day is coming up and this is the perfect menu and 2 mason jars to toast as well for good measure. Going to pin this recipe so I can make later. Thanks BAM. I think I approve of Mason Jars for birthday celebrations. They are certainly big enough to ensure everybody will think they had a good time. Thanks. Though, I do remember, as a youth, working on a building site. The steak would have set one apart from the others scoffing their sandwiches and swilling tea. I recently was given a sample of some dried shiitake mushrooms. Do you think I could substitute them in place of the porcini? Love your posts, Conor! Keep em coming! Thanks for the very kind words Debbie. That qualifies as a great question Debbie. The porcinis have a very strong flavour when dried. I have never had dried shiitake so I am unqualified to answer. Do give it a whirl (literally) and let me know please. Just thought I would ask. 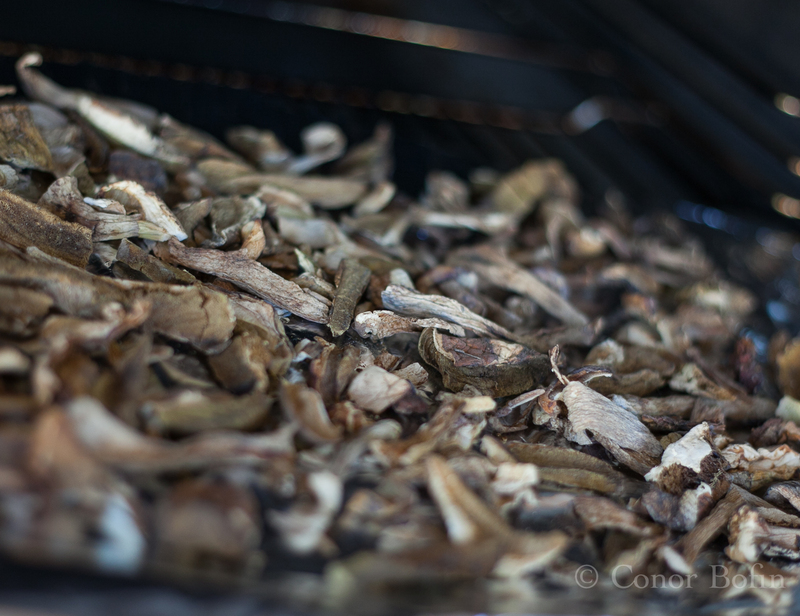 I have a farmer relying on me to let him know what can be done with dried shiitake mushrooms to help him sell them. I am looking for ideas and keeping all options open. Try reconstituting them in about a half pint of hot water. Then fry them in some butter. Use the water as part of the stock in making a mushroom risotto. It is awesome with the porcinis and other more common mushrooms. Needless to say, the mushrooms go in too. I have a post done on it. The link is at http://wp.me/p1NUXa-u5. Thanks so much for the suggestion and link! Hahahaha! That is one beautiful tenderloin. 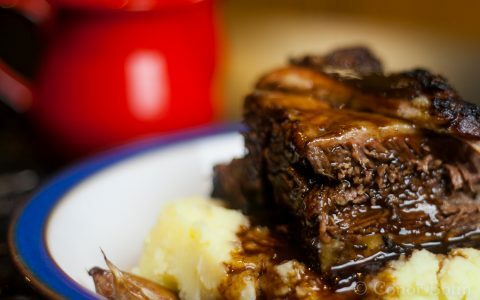 Remember I went to the Rustic Stone in Dublin for dinner? Food came out on hot stones. But because of that everything was a bit overcooked. I don’t remember the details beyond that. Silly. The Rustic Stone concept is not new. I remember being served steak on a hot stone in Portugal over 30 years ago. It is another daft idea to my mind. If one goes to a restaurant, one should not have to cook the food one’s self. 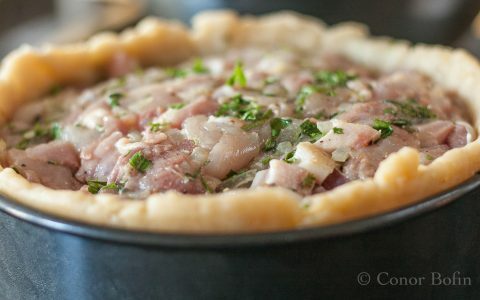 It suggests to me that the chef/patron puts very little store by their own skills and unique addition to ingredients if they get the customer to cook their own food. “Just sayin'” as they say. Thanks Michelle. Still, best on a plate. Remember Rory, when you are laughing at yourself, I am laughing there with you. It certainly was tasty. But the building site stuff is rediculuous. I love the idea of the dried porcini mushroom crust, so simple but so tasty. Too true on all counts. In truth, the restaurant that gave me the slate had been using it as a cheeseboard. There are ‘food grade’ slates sold here. One of out ‘top designers’ has even got his own slate table wear collection. Total nonsense! 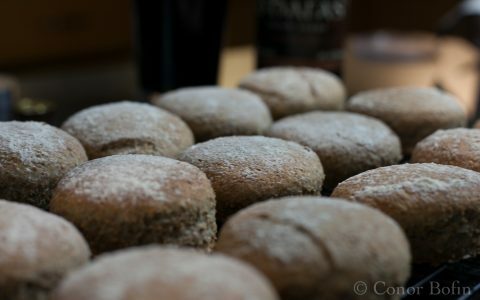 Great recipe, great photos, great post! 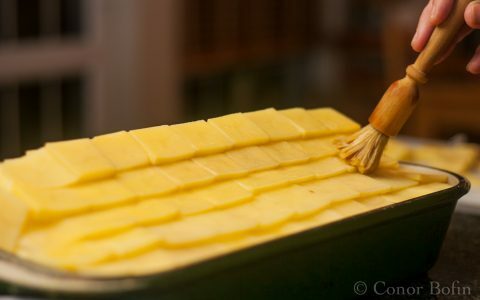 Serving on a piece of slate is fine with me, as long as it was preheated. 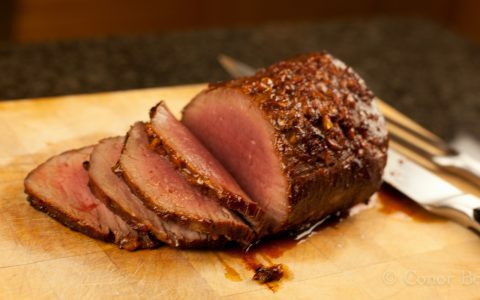 The beef looks excellent and I would not have dared to cook them without using a thermometer. You know my approach Stefan. Mind you, I did a roast rib a couple of weeks ago and the thermometer guaranteed a perfect outcome. It was delicious. 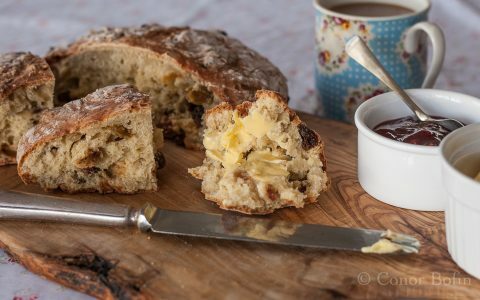 Loving your really humbly honest and generous needless step by step recipe…. i once made porcini crusted lamb rack and i guess this gonna be great with steak too!!! i can imagine the smells Conor…. I think I know what you mean. It’s funny though, some people remark that what makes my blog different is the step by step stuff. Different strokes for different folks, as they say. Keep doing what you do. It is truly fantastic. Keep at it. You have a great one too. I am just having the same fun with you Dedi. Totally needless, yet, essential. Lol too! I have some dried porcini mushrooms somewhere in all my packing boxes stored in a garage for now. I’ll HAVE to try steak with the ground porcini. Genius! It really is very easy and very tasty. Well worth giving it a go. Oh my God- buttery steak and chips? My idea of heaven!! Looks like another keeper! Wonderful! Hi Conor, I like your musings on the building site approach – does it follow that you can put your bill on the slate?? Love it. You got me!